Back in High School circa 1986, my buddies and I were so in love with punk rock that we decided one night that we would start our own band. I think the famous Cheech and Chong quote, “man it’s just punk rock, all you gotta do is be a Punk” applied. None of us really had any musical talent. I knew straight away that I would be the singer since I spent a lot of time lip synching to Generation X and GBH in the mirror. Fast forward to when we actually got some rad songs together and decided to record a four song demo. Somehow we managed to book a day at the famous Casbah Studio in Fullerton, CA. Not to be confused with the Casbah club in San Diego. This was before that place was open. The Casbah studio was where a lot of great O.C. bands had recorded like Social Distortion, D.I. 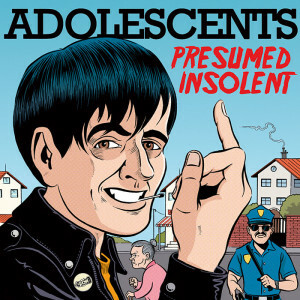 and my favorite at the time, Adolescents. I told the engineer, Chaz Ramirez, that we wanted to sound just like the Adolescents since that’s where they recorded. He told me point blank, but you’re not the Adolescents so that’s not gonna happen. OUCH! First wake up moment in life! Never the less, we charged on! But, that’s not what I’m here to talk about. 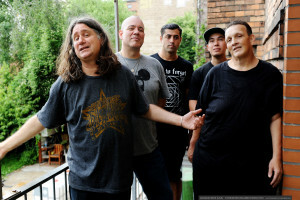 I’m here to present my second interview for ClassicPunk.com. The first was with Kevin Seconds, (CLICK HERE). As I’ve said before, I am not a journalist or a writer. I just love this music and like doing this for fun and to dive deeper into being a music fan. ME: How long has it been since the band was in the studio? ME: How is the writing and recording process work for you guys now? And how does it differ from some of the early recordings? STEVE: hmmm well our first record was our live set from the time as is the case with most bands … I can’t tell you much about the next two records (brats in battalions and balboa funzone ) as i was pretty much in a constant alcohol blackout when we made those records … when we regrouped in 2001 we spent a lot of time writing and rewriting songs that ended up becoming “oc confidential ” that record came from a heavy time tony lost two of his brothers one to suicide and one was murdered in the months leading up to it so he wanted to write as an outlet and that was what spurred us to go back to the studio and of get the band out on the road again … initially we were just going to a few reunion shows … now here we are 12 years later still doing it … so back to thee process …after oc confidential we switched up how we do things. ME: Can you tell me who is currently in the band? Mike is an old school Fullerton guy we went to high school together. I met Dan in the late 80s when he was playing with Jack Grisham of TSOL in a band called Tender Fury he has also played with Rik and Keith Morris. Armando was the drummer in El Centro we met on the Warped Tour in the 90s when I was in 22 Jacks. ME: What label will the new album be on? And what about a release date? STEVE: We release our records on Concrete Jungle. They’re a German label run by awesome dudes. Release date is late July 2013 and it will be available in the states thru Interpunk and on itunes. ME: I first saw you guys play in the late 80’s at Fenders in Long Beach. Do you remember those days and how do your shows differ now? Also, how do the shows in the late 80’s differ from the early days of the band? ME: As a bass player who is often credited for being one of the best in Punk rock, who are some of your influences and how do you approach writing those melodic lines? I know you are a core member of the writing process; do your bass parts come in after the songs are written or do the bass lines start the writing process? ME: How many other bands are you in and can you tell me about your solo records? Black Diamond Riders (we do sixties Stax covers, it’s me and Two Bags from Social Distortion, Warren and Jaime of the Cadillac Tramps, Greg Kuhen of TSOL, James Achor from Royal Crown Revue … And some awesome horn players. It’s such a fun band to play in … I sing … And have a blast! 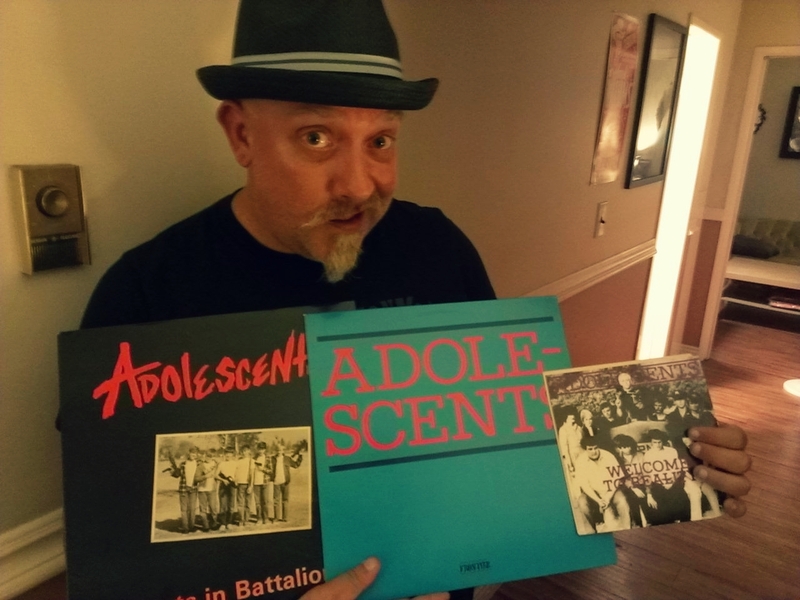 ADOLESCENTS now! That’s Steve on the right!